Tony Coenobita’s rugosus that he has owned for 15 years! Hello, I am Tony from Hong Kong. Land hermit crab can found in pet shop, but there is not much information about them. When you ask the sales how to take care of them, they will tell you to give them a little bit of water in the tank is ok and give them bread for food. I followed this method when I was a kid, of course they are all out of shell and died after few weeks. 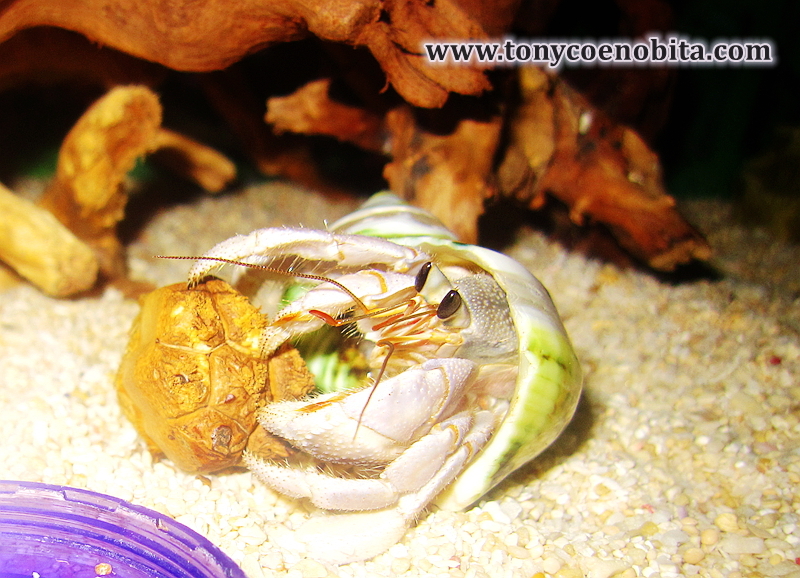 Some people even do not know they are different from marine hermit crab and will put them into aquarium. I think me and land hermit crab have a kind of so called ‘destiny’. I studied Japanese in university and one day my parent bought me a Japanese book which teaches kid how to take care of small animals, I found land hermit crab on this book and start to search information in Japan website. I found many information for them, it just like a found a treasure. There are so much detail information. Then I also start to search more in English website. I want to set up a website in Chinese. I want to gather information from English and Japanese so to give everyone a more correct way to take care of land hermit crab. My thinking at that time was because in Hong Kong, there are no land hermit crabs live in wild, they are all collect from overseas and we cannot help to release them back to wild. That mean once you bought them back home, you must do your better to treat them, to keep them as long as. I spend almost one year to set up and start www.tonycoenobita.com in 2003, I am very happy that later this website help a lot of people in Chinese to know more about them. Of course when I start my first crabitat, I lost some crabs also. Every time I lost a crab I will think what happen? Is it environment problem? Molting problem? Sea water problem etc……and then improve the crabitat. I think all the beginner had this experience and for sure we need time to improve but the most important thing is our mind. I saw some people bought tens of crab, especially many people like to buy big size and they call themselves crab lovers and very proud of it. But they never check the crab one by one every day, they even do not know which crab is molting. They just put all of them into a tank and let it go, when they found a crab died, they bought new one to replace……it is crazy!! Many people said no demand no supply that is true. However, when we see the PP with Coral is over 30 years (39 years in August), we all know that land hermit crab can live over 30 years even in crabitat. I also have a rugosus with me now 15 years in August(see attached photo). So, if everyone take a right attitude to take care of them, everyone can keep his/her crab over 30 years, I think the demand will be decrease, right? In the wild, now many crabs have been found they have to use rubbish instead of shell for their home. Catch one crab mean also catch one shell, we all know that. I really hope that one day, Conservation management strategies will be put in many countries for land hermit crab just like Japan. In Japan, only legal supplier can catch them in wild in regular amount. This can help land hermit crab not being over harvested.